France Football have announced the final 30-man shortlist for the 2016 Ballon D’Or. The winner of the award will be decided solely by a panel of journalists, after FIFA ended their partnership with France Football. From 2010 to 2015, FIFA’s Player of the Year award had been combined with the Ballon D’Or to form the FIFA Ballon D’Or, but they will be separate awards once against from this year onward. Jamie Vardy is the only Englishman on the list for this year’s Ballon D’Or, while Sergio Kun Aguero, Zlatan Ibrahimovic, Kevin De Bruyne, Riyad Mahrez, Paul Pogba, Hugo Lloris and Dimitri Payet make up the rest of the Premier League’s nominees. From the Serie A, Gonzalo Higuain, Gianluigi Buffon, Paulo Dybala – who all play for Juventus – make the list. Bayern Munich’s Robert Lewandowski, Thomas Muller, Manuel Neuer. 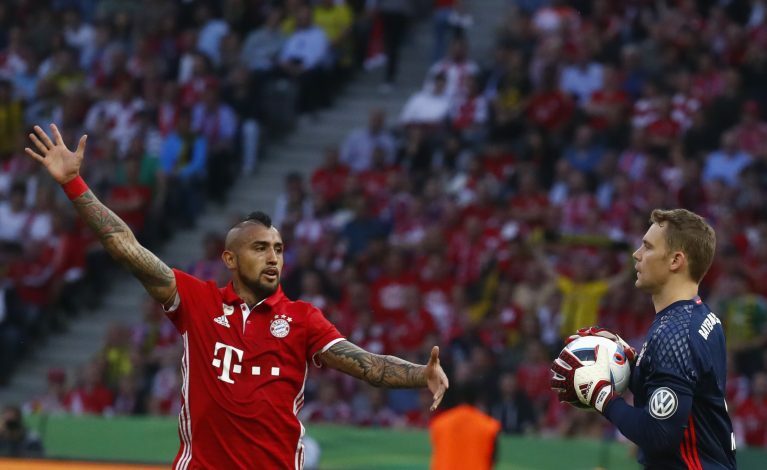 and Arturo Vidal stand alongside Borussia Dortmund’s Pierre-Emerick Aubameyang as the Bundesliga nominees. La Liga is home to the majority of players on the list, with Gareth Bale, Cristiano Ronaldo, Lionel Messi, Koke, Diego Godin, Antoine Griezmann, Andres Iniesta, Toni Kroos, Luka Modric, Neymar, Pepe, Sergio Ramos and Luis Suarez amongst the players plying their trade in the Spanish League that make up the list. Rui Patricio of Sporting Lisbon in the Portuguese League is a surprise nomination, and has been included for his exploits at Euro 2016, where he helped Portugal defy all odds to win the competition. Lionel Messi and Cristiano Ronaldo have shared the Ballon D’Or prize between them since 2008, with the Argentine being the current holder of the prestigious individual award. However, Ronaldo is the favourite to win this year’s edition of the trophy after a brilliant season with Real Madrid and Portugal, scoring the winning penalty as Los Blancos won their 11th Champions League trophy, and also scoring crucial goals at the Euros in France and captaining the Portuguese national side on their way to the trophy.